Located at the water's edge in Beverly Harbor. Hospital Point received its name from a smallpox hospital built nearby in 1801. It was destroyed by fire in 1849. The Hospital Point Lighthouse was built in 1872 in Beverly as part of a system of three lighthouses to guide shipping traffic around Salem Harbor. 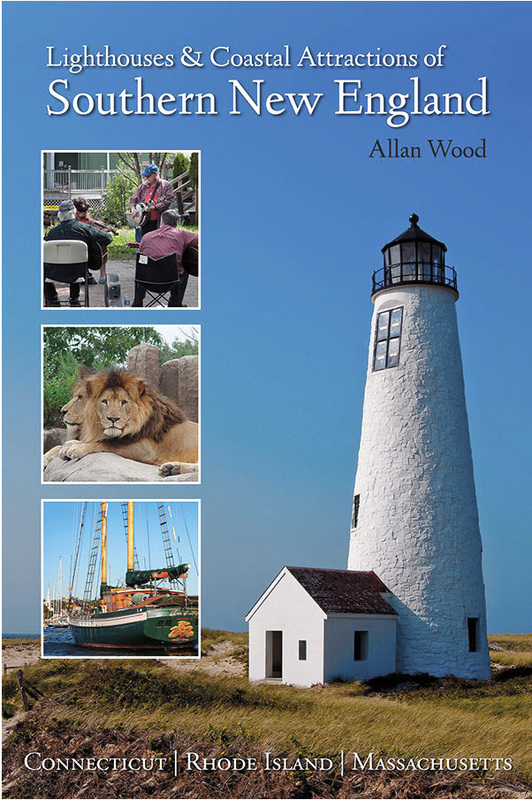 The two other lighthouses, Derby Wharf and Fort Pickering (Winter Island) were built outside the city of Salem, Massachusetts. Hospital Point was once part of two range lights, the other light from the spire of the First Baptist Church in downtown Beverly. Joseph Henry Herrick served at Hospital Point from 1873 to 1917. Making him the longest serving keeper. He was also from Beverly, served in the Civil War, and at one time was a shoemaker in the city. In the early 1900's the area around Hospital Point light become known as the local "lover's lane". Historic Beverly is an affluent community with quaint shops and restaurants, beautifully decorated homes, and plenty of community events. The North Shore Music Theater in Beverly offers professional concerts and theater events for everyone. Lynch Park provides a nice area for solace and recreation by the harbor, and a close view of the lighthouse. Many other parks and beaches are located in this community. The lighthouse can be viewed from Bayview Avenue in Beverly. Although the lighthouse is closed to the public (private residence), the Coast Guard opens the lighthouse during Beverly Homecoming Week. Take Route 93 North to US Route 95/128. Follow 95 North until it splits with 128. Follow route 128 to exit 18. At the end of the ramp, follow Old Essex Road to Route 22. Take Rout 22 South (you can also take Route 127 in Beverly), towards the harbor on East Corning Street. When East Corning Street ends, take Bayview Avenue, which ends at the lighthouse. At low tide, it is possible to walk along the shoreline from Lynch Park to get a view of the front of the lighthouse. Lynch Park is reached by taking a right on Neptune Street where East Corning Street ends. Location of Range Light: Hospital Point was once part of two range lights. The second signal was built from the remains of a lightship. The “rear” light is located in the steeple of the First Baptist Church in Beverly at 221 Cabot Street. From the end of Highway 1A's bridge over the Porter River in Beverly, follow Highway 22 for just under a mile. The church will be on your right at 221 Cabot Street. 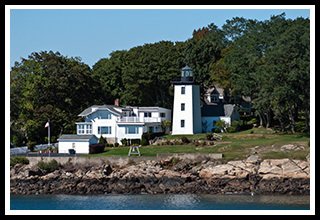 Boat cruises mentioned below may offer many types of cruise and will pass by Hospital Point Light as part of charters, narrated wildlife and historic tours, whale watching, fishing tours and other types of excursions.